Fashion, jewellery, accessories, and interior decor are Swarovski's main segments of interest and focus. Over the years, the company has acquired a respected trend competence which is well received in the haute couture world of fashion and style. Their in-house team of experts work closely with leading fashion forecasters like Promostyl in Paris and Li Edelkoort of Trend Unions - conducting detailed research and analysis. 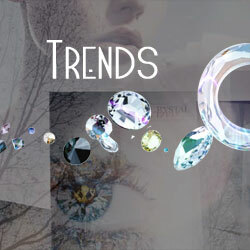 Then each fashion season, Swarovski's team of experts release 5 crystal-trend themes. They may come in combination with new innovations. The 5 seasonal crystal themes are presented using the unendingly glorious Crystallized™ - Swarovski Elements. As a direct distributor of Swarovski crystal components, ClearlyChosen is commited to bringing their customers the latest range of Crystallized™ - Swarovski Elements. They will also entertain requests for specific products from that range. Get to know Swarovski's recommended Seasonal Trends to discover the inspirational offerings that will help you create an outstanding seasonal inspirational and timeless feast of poetic beauty and romance.